Net neutrality is a topic many of us have overlooked. This needs to end now. We’ll explain what this hot button issue is all about and what you can do to prevent the negative impact some big companies are attempting to have on the internet. Basically, net neutrality ensures that all the content on the internet is available to you on an equal basis. This means that some pieces content won’t be prioritized over others just because bigger companies are paying more. This regulation is what has allowed the Internet to function as it currently does—providing us all with equal opportunity to publish and promote what we want as well as to find it. Now, what’s happening with net neutrality? With a new chief at the FCC as well as the ongoing lobbying by big companies like Verizon and Comcast, this regulation is threatened. They want companies to have the ability to pay for higher priorities. They want the chance to make money. And it’s getting close to actually happening. How does this impact your nonprofit? Imagine a world where other websites could pay internet service providers so that their site works faster than yours. As TechCrunch put it, removing net neutrality regulations means, “any organization without deep enough pockets to pay an ISP’s ransom will load much slower than those with ties to ISPs” (full article). It would create yet another space where it’s too expensive for the little man to keep up and money gets you much further ahead. 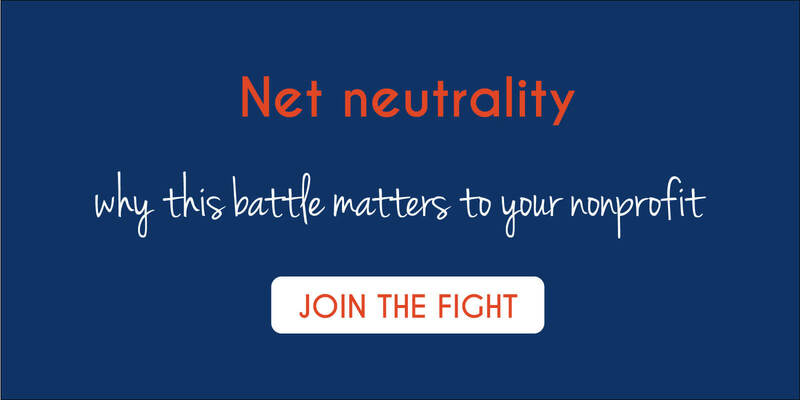 First, send your note to the FCC, saying you’d like to preserve net neutrality and Title 2. Then spread this message. Make sure your nonprofit knows the impact removing this regulation could have on all of you, your communities and the world at large.